I phoned Eton Canada’s customer support number and reached a friendly lady who immediately responded with a solution as soon as I mentioned “sticky rubber”. She stated that Eton officially recommends a product called “Purple Power Industrial Strength Cleaner/Degreaser” because it is water-based, non-toxic, biodegradable, non-abrasive, and contains no solvents. This reader used Purple Power to clean his benchmark Eton E1. It’s made by Aiken Chemical and can be found at auto supply shops (e.g. Autozone, NAPA, etc. ), home improvement stores, and a few major retailers (such as Walmart). The method involves dampening a cloth or microfibre towel with the cleaner, then wiping the radio in a single direction with gentle pressure. Don’t rub back and forth or swirl in circles. It won’t remove logos, lettering, or numbers. The agent stated that only one cleaning is necessary. The rubber coating will remain non-tacky, permanently, after using Purple Power. Having said all that, I haven’t personally tested it. You’ll might recall that I had already cleaned my radios with oven cleaner. Therefore, if one of your other readers already has a jug of Purple Power handy, maybe they can test it out and report back to us. Thank you so much, Derrick, for taking the time to share this. I’m happy to hear that Eton endorses the use of Purple Power–we posted an article about this cleaner five years ago. Sticky radios are so common, we have a number of posts in the archive on the topic. My Grundig G6 desperately needs cleaning–its chassis is incredibly sticky at the moment. I also know I have some Purple Power at home, so when I return from travels I’ll put it to work on the G6! Click here to check out Purple Power at Amazon.com (affiliate link). As Derrick notes, Purple Power is also widely available at local auto parts stores, home improvement stores and big box retailers. This entry was posted in News, Shortwave Radio and tagged Derrick Yamaura, How to clean sticky radios, Purple Power, Sticky Radios on August 29, 2018 by Thomas. Simple Green: Did nothing. Don’t bother. Goo Gone liquid: Very limited results. Had to scrub a lot for minimal results. Not worth it. Simple Green Grill Cleaner: Worked well. Sprayed a portion of the radio, waited a minute and then cleaned with microfiber cloth. Had to use a little elbow grease, but results were good. Goo Gone Kitchen Cleaner (foaming degreaser): WINNER by far! Easily and quickly cleaned sticky gunk off radio. Sprayed portion and then easily wiped clean with microfiber cloth. No damage to writing or graphics on radio. Whole radio took about 30 minutes. It would have been faster, except there are a lot of dials and nooks and crannies to work around. Thanks for the tip, Steve! I’ll add this to our growing list of sticky radio remedies! This entry was posted in News and tagged Goo Gone Kitchen Degreaser, How to clean sticky radios, Steve Z, Sticky Radios on January 10, 2018 by Thomas. One thread that’s had a surprisingly long run here on the SWLing Post deals with sticky radios. A number of portable radios manufactured in the past decade were coated in a rubberized, tactile material that was quite functional when the products were new. With time, however, the coating breaks down and becomes incredibly sticky to the touch. We’ve published a number of articles about how to clean sticky radios–click here to read our archived posts. Gunk on radios – I was the lucky winner of an E1 at one of the ‘fests. Of course, the coating went bad and it would up looking like the flypaper/Wino of radios. I made a desultory attempt at cleaning it (using that Purple Power stuff) but it was a nasty, dirty job that I didn’t complete. A disheartening mess. Fast forward three or four years after that. I had some time on my hands, I took another look at the radio. I found that the gunk continues to mutate – it had actually lost most of its ability to adhere to the radio’s casing. Now it would rub off with a paper towel and nothing else. A couple of rolls of paper towels and some Pledge left it something you no longer needed to put gloves on in order to feel comfortable touching. So – another fix for the gunk – time and patience. No cleaners needed. Thanks for sharing, Lee. Worth noting: if you gave up on your sticky radio some time ago, perhaps you should pull it back out of storage and see if the coating has deteriorated to the point it might simply rub off? Time might have made the job much easier. 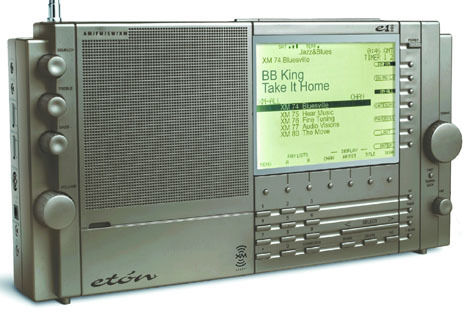 This entry was posted in How To, News, Portable Radio, Radios, Space Weather and tagged Eton E1, How to clean sticky radios, Lee Reynolds, Sticky Radios on July 10, 2017 by Thomas. One more “sticky radio” suggestion. Here in the Houston area we are getting in to the heart of hurricane season. I have a little Eton FR-300 radio that has am, fm, tv and weather bands, a flashing red light, a white light, and a siren. I hadn’t picked it up in some time, and, while doing a “emergency inventory” today, I picked it up and it was so STICKY!!! The first thing tried was rubbing alcohol, but the type suitable for first aid which is only 50% which just spread the stickiness around. I did a “sticky radio” search and up came your blog, which I am already familiar with (no stickiness issues on my trusty Sony ICF-SW/7600GR) . When I browsed the suggested solutions, “citrus-based” came up. Turns out I had the solution under my sink: “Veggie Wash” is a citrus-based product used to clean fruits and vegetables, and now, radios! Squirted some on a paper towel and it does the job nicely. Thanks for the suggestion! Like you, I imagine many others will have Veggie Wash on hand. This entry was posted in How To, News, Shortwave Radio and tagged Cleaning Radios, How to clean sticky radios, Sticky Radios, Sticky Shortwave Radios, Veggie Wash on August 29, 2016 by Thomas. Sticky radios? John shares yet another solution. It took me a total of less than 3 hours to clean both my E1s. I used a lot of paper towels, working a section of the radio at a time, spraying the solvent onto the towels and then rubbing the surface free of the degraded and sticky rubberized coating. After removing the coating, I simply wiped down the radio with a wet paper towel to remove any residual solvent. They are now clean and smooth and look like new with all the white print intact. And my hands didn’t suffer any from contact with the solvent. A reminder if you do this: It’s important to seek out citrus-based solvents and avoid petroleum based solvents. It was so easy with this product that I wished I had done this a long time ago and wasn’t so nervous about taking it on. Thank you, John! I just noticed that a few of my rubber-coated receivers are starting to get tacky. I like the idea that this adhesive remover is gentle on the chassis. Click here to search eBay for MaxPro Ink/Adhesive Remover. We’ve posted a number of solutions for sticky radios. Click here to view past posts. 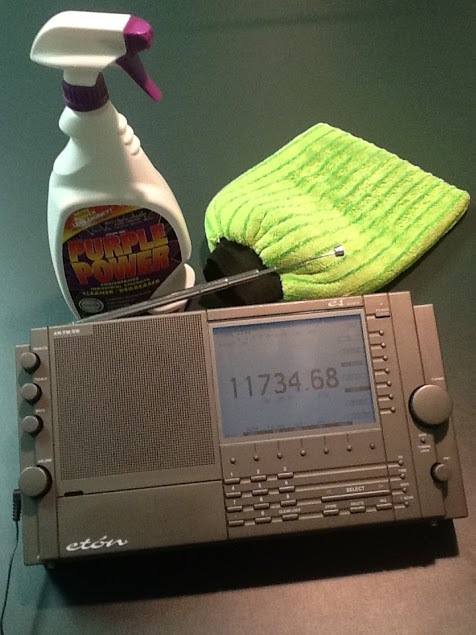 This entry was posted in Articles, How To, News, Portable Radio, Shortwave Radio and tagged Cleaning Radios, How to clean sticky radios, John Figliozzi, Sticky Radios, Sticky Shortwave Radios on August 19, 2016 by Thomas.